Minister for Employment and Social Protection Regina Doherty has said that having a Public Services Card is mandatory to access certain public services. Separately, the Department of Social Protection has confirmed in a statement that the card, which was first introduced in 2011 for people getting Social Welfare payments, "is now being rolled out to other public services". Speaking in Donegal, Ms Doherty said the Public Services Card is "no more and no less than a card that allows you to access public services". The minister said that there was a lot of concern about it becoming compulsory, however she said it is " no more compulsory than having a driving license is". 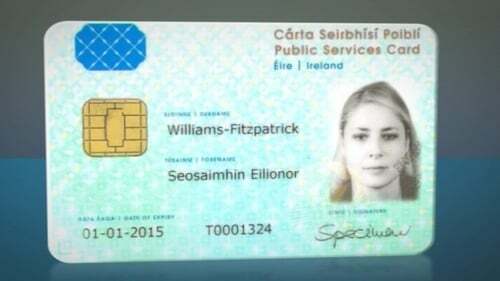 Ms Doherty said that this position was not new, and that the position had been the same since the introduction of the card in 2011. A person is not required by law to register for a Public Services Card. A person is not required by law to provide it to a member of the police force at their request, and an Garda Síochána is specifically precluded from requesting an individual to produce the card as proof of identity. Bodies not specified in the legislation in either the public or private sector may not request the card or may not be required to use it in any transactions. The Irish Council of Civil Liberties earlier called for clarification from the Government on whether a Public Services Card is the sole form of acceptable identification to access a wide range of services. The card was introduced five years ago to replace the old Social Services card to collect Social Welfare payments and the Free Travel Pass. Mr Herrick said: "There is a material difference between a voluntary card and mandatory card, which we have never had." "There is some ambiguity in the State agencies as to whether this is mandatory or not. "Members of the public are saying to us they are not getting a clear answer. As well as not being told whether it’s essential you apply or receive this card, it's also not being made clear if alternative forms of identification will still be acceptable. "This is the key question again of mandatory or voluntary". Social Democrats co-leader Róisín Shortall has called for a public debate on the issue. She said government agencies have refused to provide pension payments or driver theory tests without the PSC, which she described as a "creeping introduction of a mandatory ID card scheme by the back door".